Thank you for allowing Tristar Fire Protection the opportunity to respond to your needs. If you need immediate assistance, please contact us at (617) 820-2702. Please provide us with the following information so we may process your request as quickly as possible. Tristar Fire Protection is a total fire protection company specializing in providing exceptional customer service by competent, licensed and trained technicians for all your Fire and Life Safety requirements. We are one of the most reliable fire protection companies for commercial, industrial and residential areas. Get in touch with us via free quote request form. Working with Felipe and his team was a dream. They were always on time always pleasant, and their work was top of the line! We will be using Tristar Fire Protection in the future for another fire protection service. We were very pleased with the overall job, the quality of the finished product and the integrity of the people at Tristar Fire Protection. They are wonderful to work with. Felipe and his team were amazing. I appreciate his honestly, expert advice, and constant professionalism throughout what can be a very stressful and momentous time. I completely recommend his company to anyone! We can highly recommend Felipe and his company for any fire protection job. There were no surprises or changes to the written estimate. Thanks for doing such a great job! 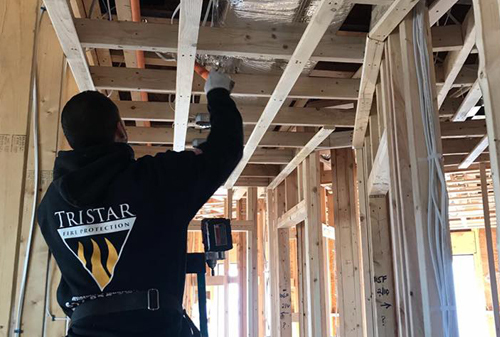 We can't say enough about the quality of work and the quality of skill and commitment to the job exhibited by Tristar Fire Protection. Thanks for everything Felipe. We'd like to say thanks again for the beautiful job you all did! The guys doing the work have all (with no exception) been so polite, nice and accommodating. We won't hesitate to recommend Tristar Fire Protection to friends. Our technicians are well trained and qualified for any type of fire and safety services with years of experience. Price is a valid consideration when it comes to choosing a fire protection company. We have all the modern fire safety equipment with qualified, and speedy technicians to operate them. Tristar Fire Protection is the best solution to your fire and safety problems and needs. Professional fire protection contractor in MA for all your needs.